USA Archery requires all participants of JOAD Youth Groups to join their organization after 3 sessions in order to continue participating. To join, click here! Youth ages 8 and older may join one of our Junior Olympic Archery Development (JOAD) groups, the Carolina Bullseyes, based on availability and prior approval. This program are split into two separate age groups: one is for ages 8-11 and the other is for ages 12 and up. Both age groups meet indoors weekly at 7711 Welborn, Suite 109. 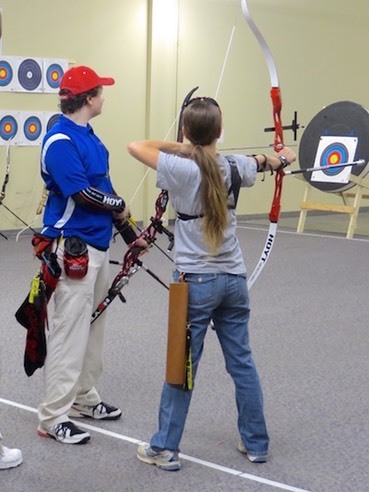 See the Youth Group/JOAD class schedule here. Youth archers must have basic archery skills and range safety knowledge before they will be allowed to shoot in a group setting. This may require that an archer take one or more private archery lessons before being considered for youth group membership. These private lessons ensure safety for everyone. Youth program sessions focus on proper archery techniques, consistency and safety. Sessions vary and may sometimes include games and other archery-related activities. Session fees are payable in advance (4 session minimum). Youth may attend sessions as their schedules permit. Pre-paid session fees are “debited” only to sessions they attend. After participating in 3 Youth/JOAD sessions, USA Archery rules require archers to maintain an annual Youth membership in USA Archery. Reduced-cost reciprocal memberships are available to NFAA members. To join online, go to USA Archery’s website.